Yesterday’s investigations into plants, focusing on names, both common and botanical: mail from a friend, a gift plant for my birthday, and grass plants for cooking. Shooting stars. 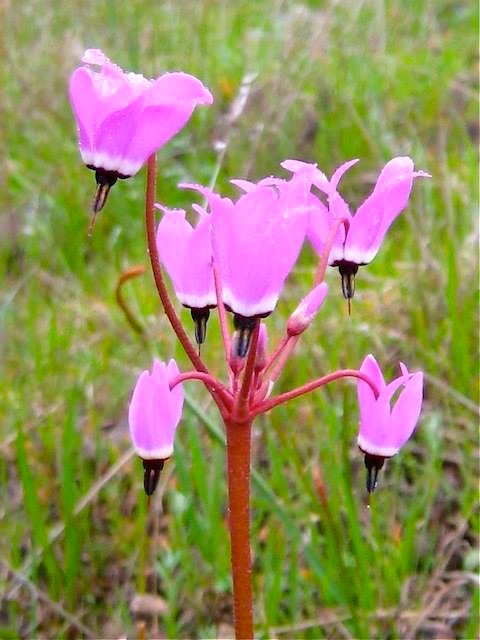 My friend Susanne Riehemann, appreciating the reference to the Primulaceae in “Birthday flowers”, sent me an image of one of her favorite plants in the family, encountered in hiking in the Bay Area: Dodecatheon, or shooting star. An old favorite of mine as well. Dodecatheon is a genus of herbaceous flowering plants in the family Primulaceae. The species have basal clumps of leaves and nodding flowers that are produced at the top of tall stems rising from where the leaves join the crown. The genus is largely confined to North America and part of northeastern Siberia. Common names include shooting star, American cowslip, mosquito bills, mad violets, and sailor caps. A few species are grown in gardens for their showy and unique flower display. Shooting star is the only common name I know for these plants, and it’s pretty uncomplicatedly metaphorical. But the botanical name is puzzling, and I haven’t found a good explanation for it: Dodecatheon is ‘twelve gods’ (from Greek), presumably referring to the twelve Olympian gods. But why? 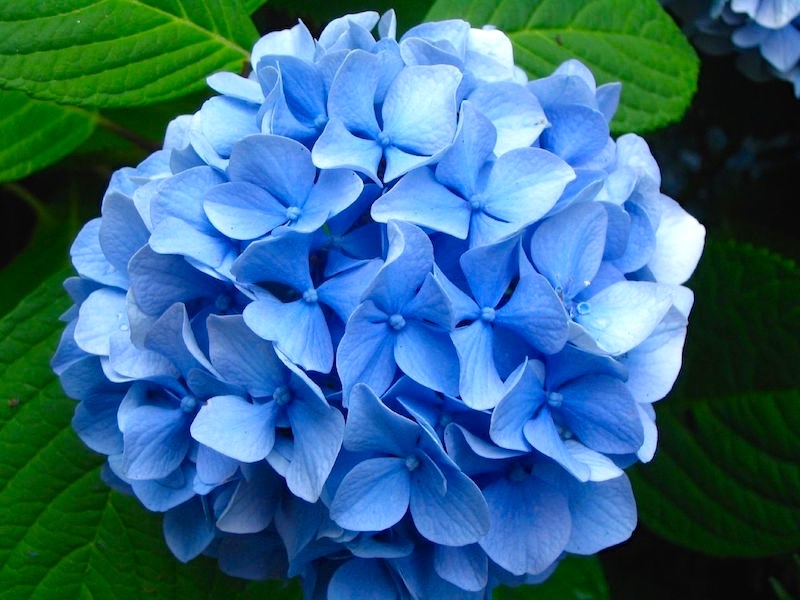 Hydrangea … common names hydrangea or hortensia) is a genus of 70–75 species of flowering plants native to southern and eastern Asia (China, Japan, Korea, the Himalayas, and Indonesia) and the Americas. By far the greatest species diversity is in eastern Asia, notably China, Japan, and Korea. Most are shrubs 1 to 3 meters tall, but some are small trees, and others lianas reaching up to 30 m (98 ft) by climbing up trees. ORIGIN modern Latin, from Greek hudro- ‘water’ + angeion ‘vessel’ (from the cup shape of its seed capsule). In most species the flowers are white, but in some species (notably H. macrophylla), can be blue, red, pink, light purple, or dark purple. In these species the color is affected by soil pH. For H. macrophylla and H. serrata cultivars, the flower color can be determined by the relative acidity of the soil: an acidic soil (pH below 7), by the influence of sundry agents in the soil, such as alum or iron, will usually produce flower color closer to blue, whereas an alkaline soil (pH above 7) will produce pinker flowers. This is caused by a color change of the flower pigments in the presence of aluminium ions which can be taken up into hyperaccumulating plants. The plant I was given came with instructions to use acid fertilizer. Hydrangeaceae is a family of flowering plants in the order Cornales, with a wide distribution in Asia and North America, and locally in southeastern Europe. … The fruit is a capsule or berry containing several seeds, the seeds with a fleshy endosperm. Lemongrass. 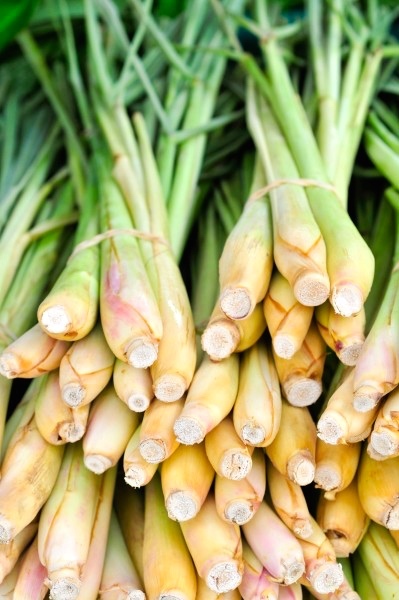 Breakfast discussion turned to lemongrass, which I grew in containers for years (both in Ohio and here in California), for use in Chinese cooking. It is in fact a grass (in the Poaceae), and it’s absurdly easy to grow: get a stalk from your local Chinese grocery, let it root in water, and then plant it in soil. It will flourish and divide. Outside of a container, it will sprawl; we were reminded of the threat that bamboo plants present to local gardeners. Cymbopogon, commonly known as lemongrass … is a genus of Asian, African, Australian, and tropical island plants in the grass family. Some species (particularly Cymbopogon citratus), are commonly cultivated as culinary and medicinal herbs because of their scent, resembling that of lemons (Citrus limon). 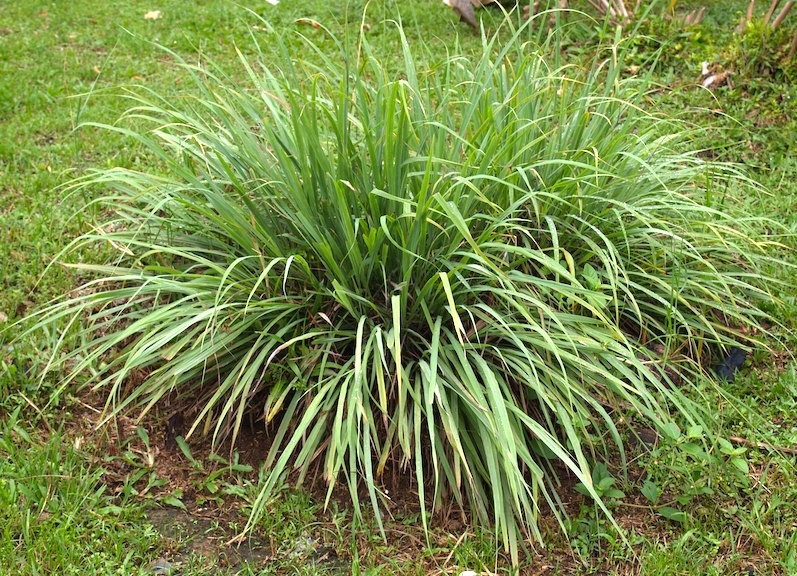 Common names include lemon grass, lemongrass, barbed wire grass, silky heads, citronella grass, … amongst many others. The name Cymbopogon is said to be derived from the Greek words pogon (beard) and kymbe (boat), with respect to the shape of the flower. The resemblance is fleeting to my eye, but let that pass. This entry was posted on September 7, 2015 at 10:05 am and is filed under Categorization and Labeling, Language and plants, Names. You can follow any responses to this entry through the RSS 2.0 feed. You can leave a response, or trackback from your own site.